An exciting pot... or not ! Yet again I have been trying to sort through various boxes of stored "stuff" which has accumulated over the years and came across a familiar pot which has surfaced on occasion. When I first acquired it via a Great Aunt many year ago I was disappointed that it didn't carry a very illustrious name and I lost interest in it. On its latest outing however I started to get quite excited about it, I discovered it was made by Hill Pottery Company between 1861 and 1867 and since the company only existed for that brief period it is quite scarce. 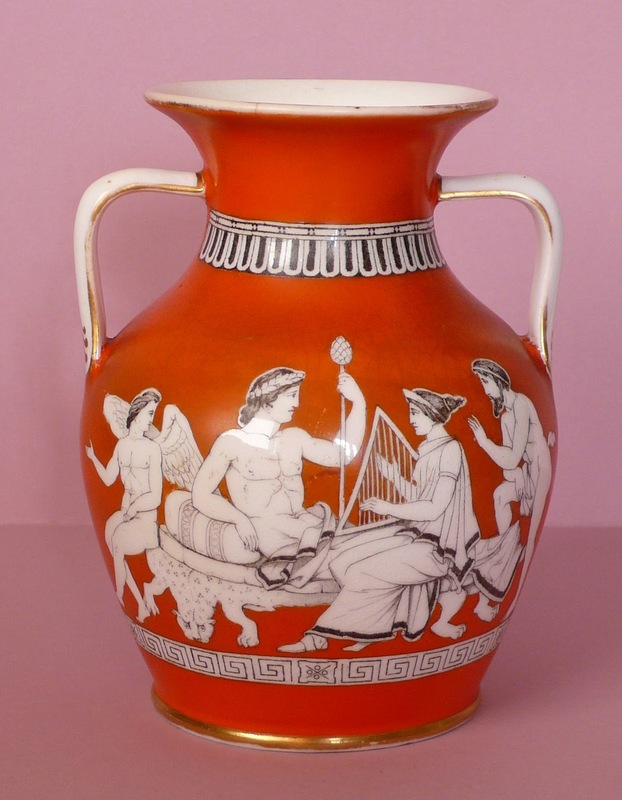 So all prepared for my Antiques roadshow moment and planning how I would spend the money I sought an opinion from a well known Auctioneer and discussed my pot with their ceramics expert. Oh dear, and such a sense of deflation; My pot is indeed quite scarce and items from the company well regarded in terms of quality but sadly few people collect them and those that do seem to lack sufficient passion to pay very much for them. So for the moment I will keep the pot as a reminder not to get too excited too soon when delving through the family treasure trove. Oh, I did also think that perhaps exposure of my pot on the internet might create some interest, after all it would be an inexpensive way to start a collection of rare pots by little known potters from Burslem... and perhaps a little interest from the right quarter could create a more exciting market in the future for my little orange pot. Looking at it again I can't help but be amused that although these are described as "Greek Revival" Victorian British taste required that the figures be more discretely draped on these items than they were on the ancient originals. Perhaps the factory would have been more successful if the designs had been racier ! 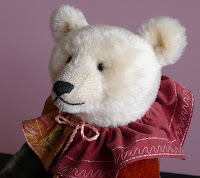 It has been a very busy time so my bear for this year's Green Party at House of Bears began his journey rather late and I am keeping my fingers crossed that he will actually arrive in time ! 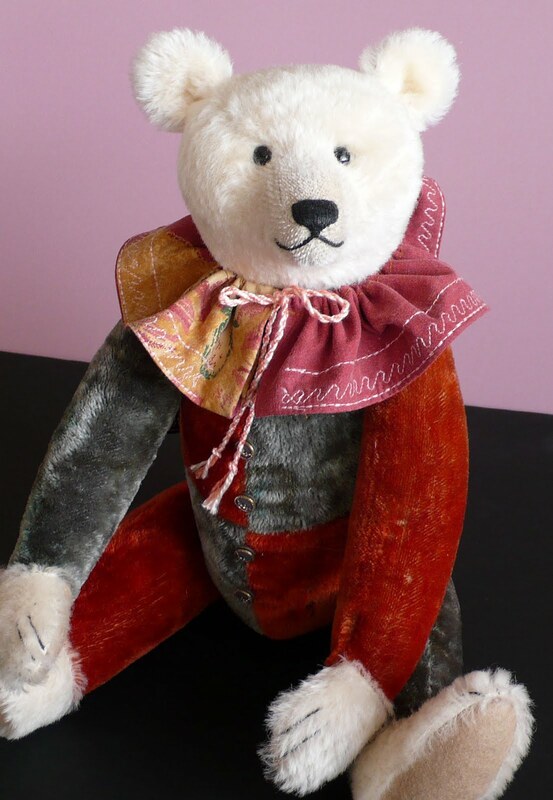 The theme is Old Timers and I am not very strong on theme ideas but I enjoyed the chance to use stronger colours and make a "traditional" Teddy bear Clown. 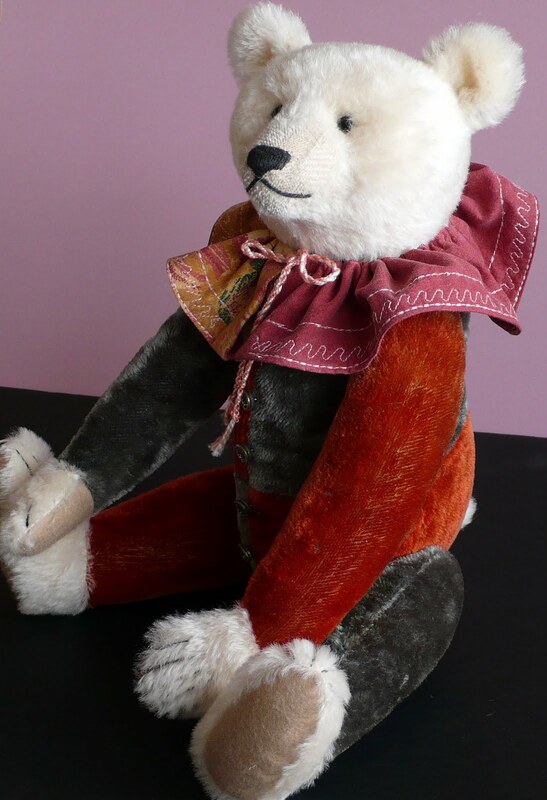 His suit is made from vintage mohair plush, fragile but strengthened, and the white head and feet are made from new mohair which has been quite subtly aged and fatigued. His excelsior stuffing has been left quite loose and crushed so he has a slightly saggy crunchy feel, the trimmings are vintage buttons and a simple collar made from old fabric.